Last week, three different publications, the US’s “Cruise Week,” the UK’s “Travel Weekly” and Finland’s “Cruise Business Review,” all highlighted how the cruise lines seem to be having difficulty growing their traditional markets. We have a look at these comments and what might be done. As Iceland’s volcanic geography raises a possible threat to travellers once more, we also look at that situation. And finally, the Funchal is returning to Australia in 2015. In America’s “Cruise Week” last week, Brad Tolkin, co-chair with brother Jeff of World Travel Holdings, owners of retail brands Cruises Only, Cruises.com, Cruises Inc and Cruises One, talked about how the industry must get its penetration rate above the 3 to 3.3% of the US population that cruises each year. Tolkin suggested that the way to do this is for CLIA to mount a higher profile in promoting cruising to consumers, maintaining that resort hotel operators may be seeing growth that the cruise lines are not while they compete with each other. He suggested using heavy hitters such as Arnold Donald from Carnival Corp & plc, Richard Fain from Royal Caribbean and Kevin Sheehan from Norwegian Cruise Line as public figures who could promote cruising as against land holidays. This would not be the first time this approach was recommended. When he was in charge of Carnival Cruise Lines, Bob Dickinson did much the same thing, saying that cruise lines should be competing with Las Vegas (which attracts more than twice as many visitors as all cruise ships worldwide) and not with each other. Back then, the industry had enjoyed a compunded annual growth rate of 10% for over a quarter of a century, since 1970. 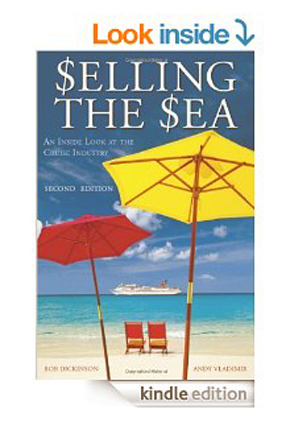 And in the book, Dickinson and Vladmir covered many of the topics people are exploring today: (1) All Noncruisers Are Not Alike, (2) Barriers to Entry (price, confinement, boredom), (3) The Appeal of Cruising To First-Timers and (4) Value. Since that time, however, growth has slowed, so that in the past five years to 2013 the market has grown by only 15.1% overall in the US (3% a year) and 16.4% in the UK. This compares with 130.3% in Australia, 84.8% in Brazil, 80.5% in Germany, and 60.7% in France over the same period. But although the US and UK are seeing slow growth, the real laggard, with the worst growth of all markets measured by CLIA, has been Canada, with a five-year growth of only 1.3%! Unless there is an error in the way CLIA adds up its figures because of the porous border, some work is surely needed here. In real terms, Canada’s 734,000 cruisers in 2013 stood behind Australia’s 760,000 and only slightly exceeded Brazil’s 732,000. In real terms, again, they only exceeded Spain’s 600,000, France’s 520,000 and Scandinavia’s 350,000. One thing the all-inclusive resorts don’t do is “nickel and dime” their customers once they check in. This is something that cruise lines do, and they are learning, but learning slowly, rather than be ruled by that part of the market that lives on price, cruise lines should be bolder in selling all-inclusive product up against land-based resort hotels. Experiments such as Celebrity Cruises’ drinks package, followed by those of lines such as Princess and Royal Caribbean, and Norwegian Cruise Line’s recent experiment with all-inclusive add-ons need to be developed and perfected. Unless their cruises are really loss leaders to grow a market, how flawlessly lines such as Pullmantur and Croisières de France manage to do this in Europe could be used as the model. Countering this, however, might be how Costa has been busy dismantling its former Iberocruceros brand, presumably because the brand has not been making money. The upmarket lines have already learned how to do this and the late conversion of Crystal Cruises to all-inclusive along with the addition of the upper premium Azamara Club Cruises seems to prove that this is the right way to go. Regent has even taken this a step further by including shore excursions, a step that no one else has decided to take outside many of the small ship operators, who do the same thing. An interesting statement. Whatever the cruise lines build, no matter how big, no matter what bells and whistles they offer, no matter how inclusive or not inclusive, the customer will always be right. And if the real competition in terms of growing the market is other offerings in the holiday market, then both customers and potential customers should be listened to. Some lines do it better than others. Last week had Iceland’s Bardarbunga volcano, which is located under Iceland’s biggest glacier, potentially causing another ash cloud and a threat to nearby aviation, thus wreaking possible havoc with holiday plans throughout Europe. This week, that threat level has been downgraded from red to orange. Airspace over the site is closed but all of Iceland’s airports remain open. So far so good. At the time the Eyjafjallajökull volcano erupted in 2010, the aviation authorities closed most of the airspace around Europe and across the Atlantic, and airlines were furious because they felt the authorities had over-reacted. Cruise lines, meanwhile, could not get passengers to and from many of their ships. Experience was gained, however, and since then lots of research has been done in order to avoid any such calamitous closure again. In the event of a similar event, the likelihood of such a huge disruption would be less today. If circumstances did cause a repetition of 2010 however, the circumstances for some long-distance travellers would be different this time. In 2010, the disruption occurred in April, when cruise ships were on their annual positioning voyages from the Americas to Europe and lines such as Princess, sailing from Fort Lauderdale, and Silversea, from New York, were able to offer any excess capacity to travellers trying to get to Europe. Should a disruption occur in the autumn, however, it would be of more benefit to those travelling in the opposite direction as cruise ships are then generally sailing back from Europe to the Americas, with many of them actually calling on Iceland. The autumn months see many calls at Reykjavik by cruise ships headed for Montreal, Boston and New York. Disruptions due to volcanic activity in Iceland are nothing new. The small uninhabited island of Surtsey, the most southerly part of Iceland, was formed by a volcanic eruption in 1963. Ten years later it affected nearby Heimaey, the largest island in the Westman archipelago, and the largest and most populated off the Icelandic coast, with a population of 4,500. In January 1973, lava flow from the Eldfell volcano destroyed half its town and threatened to close the harbour, its main source of income from the fishing fleet. Only an operation to pump cool seawater onto the advancing lava flow saved the harbour. Often pictured on post cards passing these eruptions was the 3,858-ton 167-berth Gullfoss, a vessel completed in 1950 by Burmeister & Wain of Copenhagen for the Iceland Steamship Company’s Copenhagen-Leith-Reykjavik service. 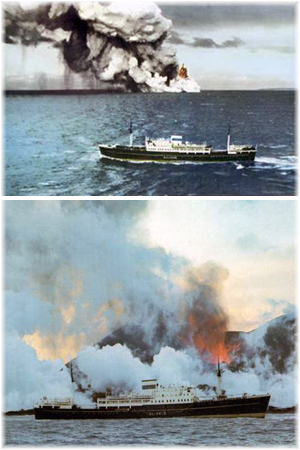 Such post cards were sold after both the Surtsey and Heimaey eruptions. 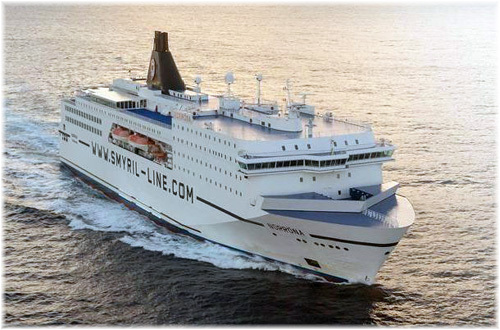 As successors, the Smyril Line offers weekly service between Europe and Iceland today with its 35,966-ton 750-berth night ferry Norrona, sailing from Hirtshals on Denmark to Iceland by way of the Faroe Islands. Iceland is served between March and October and is also sold as a 7-night cruise from Denmark, with fares from €289 to €469 per person, the latter in high season. The Norrona serves the Faroes year-round. For two winters now Cruise & Maritime Voyages’ 600-berth ms Astor, has been offering seasonal service between Europe and Australia, primarily between London Tilbury and Fremantle. This ship replaced the line voyages that had been performed by the now defunct Classic International Cruises of Lisbon. The Astor’s next southbound trip departs Tilbury on November 5, 2014. But the return of the 482-berth Funchal to Australia under new owners Portuscale Cruises will next year see the Portuguese ship based at Geelong for a series of cruises concentrating on Tasmania and the Bass Strait. 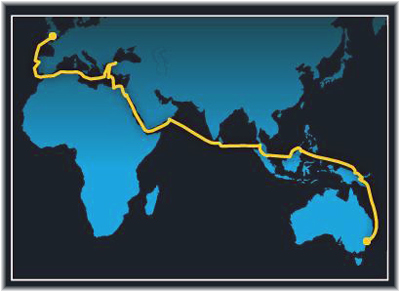 It will also provide two more line voyages to and from Australia on a classic ship. It has been some time since the Funchal was last in Australia as she had already been succeeded by the 550-berth Athena, now trading as Portsuscale’s Azores, but Funchal has recently undergone a $22 million upgrade in Lisbon. To position the Funchal in Australia next year, she will offer a 44-night “Suez Sojourn” cruise, leaving Barcelona on January 4, 2015, and making calls at Tunisia, Malta, Port Said, Aqaba, Safaga, Kochi (formerly Cochin), the Maldives, Singapore, Semarang, Komodo Island, Dili and Port Moresby before arriving in Newcastle NSW on February 17. After a short summer season sailing from Geelong, she will the depart Newcastle on March 10, 2015, for a 56-night “Battlefields & Gallipoli” cruise calling at Lae, Wewak, Sandakan, Pelabuhan Bintulu, Singapore, George Town, Colombo, Salalah, Sharm el-Sheikh, Alexandria, Heraklion, Çanakkale, Istanbul, Myrina, Piraeus, Malta, Gibraltar and Porto before arriving at Portsmouth on May 5. Cruise & Maritime’s Astor will then follow on March 16, 2015, with a departure from Fremantle bound for Tilbury via the Cape of Good Hope. Astor Bookings can be made either way to or from Cape Town as well.